In the photo below, I’m standing below one of the world’s most recognizable mountains. Where am I? This was solved rather quickly on Facebook by my friend Reyn, who identified the location as Zermatt, in German-speaking Switzerland. (Other official languages in Switzerland are French, Romansh, and Italian, with each spoken regionally depending on where one is in the country.) Zermatt has more alpenhorns than cars (truly! ), and is one of the most expensive places I’ve yet visited. 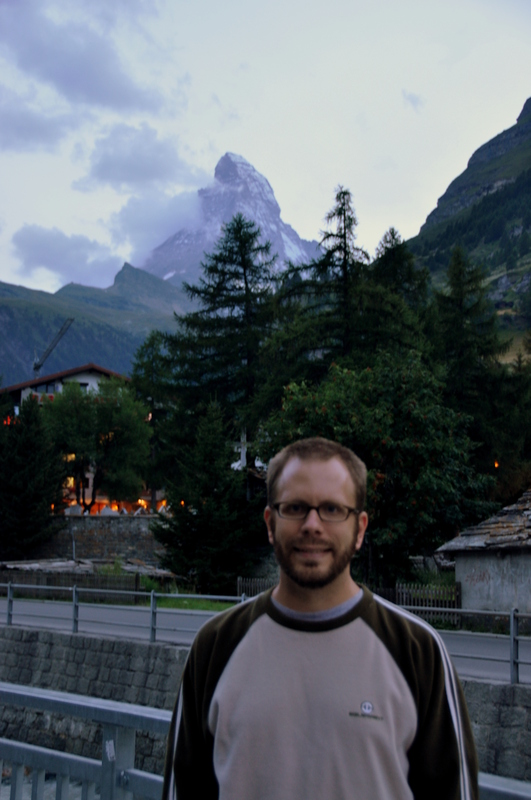 The mountain behind me is the ~15,000-foot Matterhorn. Its pyramidal peak is among the most recognizable in the world, and even spawned a Disneyland roller coaster of the same name. I hiked two-thirds of the way to the summit in August, 2010, but had to turn back due to inclement weather. Thanks for guessing Reyn, Jules, and others! Somehow I thought Switzerland when I saw the mountain, but I couldn’t recognize the Matterhorn… even when it’s the one in the Toblerone chocolate!! !